[PDF] Rewrite Right! : Your Guide to Perfectly Polished Prose: 2nd Edition | Free eBooks Download - EBOOKEE! Description: Everyone knows that writing can be improved by the simple process of reviewing, editing, and rewriting, but many struggle with how to go about critiquing their own workâ€”be it a letter to a friend, an important business document, or an academic essay. 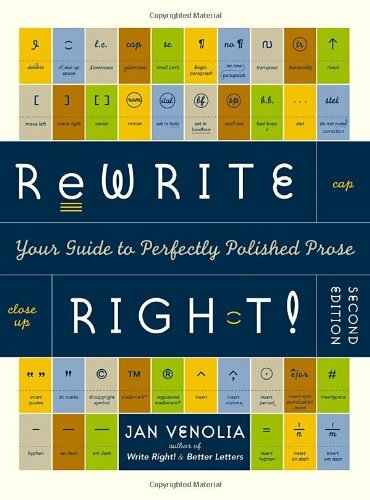 Fortunately, help is at hand in REWRITE RIGHT!, the definitive guide to polishing your prose. According to writing authority Jan Venolia, the skills needed to revise your work are surprisingly easy to learn and a cinch to incorporate into everyday writing routines. This practical guide describes in clear, direct language how to effectively rewrite a report, letter, essay, or article, so that writers of all levels can improve the quality of their work and harness the power of language. 2018-01-25[PDF] Self Confidence: Your Guide to Developing Self Confidence, Self Esteem, Irresistible Charisma and Overcoming Anxiety! No comments for "[PDF] Rewrite Right! : Your Guide to Perfectly Polished Prose: 2nd Edition".